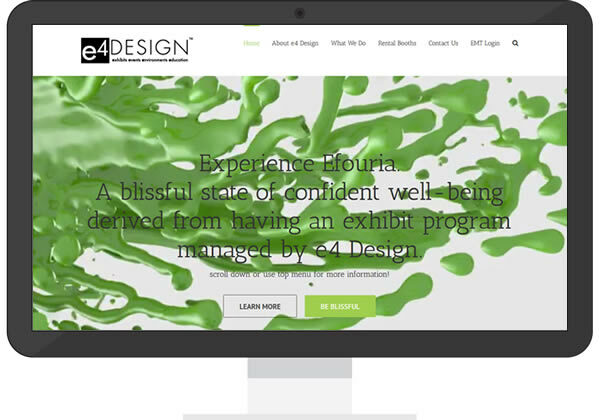 With a team of over 40 employees, e4 Design has been a leader in the trade show industry for over 25 years. We have worked with e4 through many iterations of their website over the years, the latest version is a WordPress site spanning over 200 pages. The new content management system allows e4 to execute a strategic marketing approach focused on creating and distributing valuable, relevant, and consistent trade show industry content to attract and retain a clearly-defined audience — and, ultimately, to drive profitable customer action. Among the many features of the recent site upgrade include an e-commerce style gallery to showcase over 40 trade show booth configurations, categorized and tagged with detailed meta data for search and display. The site also features a highly dynamic, video based home page as well as a portfolio catalog of recent projects, trade show tips, tools and articles.